I must confess to a penchant for Vampire Folklore. I don't know why. Perhaps because for me, the undead possess a tragic romanticism. My parents did not believe in censoring my reading material, so I read Bram Stoker's Dracula long before I could understand the feelings that it aroused in me. I think my very first movie star crush was Frank Langella when I was all of 10 years old. He made drinking blood oddly, disturbingly, deliciously sensual. I was both scared silly and completely titillated. And though campy by some standards, I absolutely adored Anne Rice's Vampire Chronicles. Even a completely lamentable performance by Tom Cruise could not spoil my delight in seeing her narcisstic protagonist and his progeny brought to life on the silver screen. Needless to say, I'm always excited at the prospect of a new Vampire novel, but I've been burned a time or two. There is nothing worse than expecting Francis Ford Coppola and getting Quentin Tarantino. But the reviews were promising and the dust jacket summary was tantalizing. I decided to risk it. Starred Review. Considering the recent rush of door-stopping historical novels, first-timer Kostova is getting a big launch—fortunately, a lot here lives up to the hype. In 1972, a 16-year-old American living in Amsterdam finds a mysterious book in her diplomat father's library. The book is ancient, blank except for a sinister woodcut of a dragon and the word "Drakulya," but it's the letters tucked inside, dated 1930 and addressed to "My dear and unfortunate successor," that really pique her curiosity. Her widowed father, Paul, reluctantly provides pieces of a chilling story; it seems this ominous little book has a way of forcing itself on its owners, with terrifying results. Paul's former adviser at Oxford, Professor Rossi, became obsessed with researching Dracula and was convinced that he remained alive. When Rossi disappeared, Paul continued his quest with the help of another scholar, Helen, who had her own reasons for seeking the truth. As Paul relates these stories to his daughter, she secretly begins her own research. Kostova builds suspense by revealing the threads of her story as the narrator discovers them: what she's told, what she reads in old letters and, of course, what she discovers directly when the legendary threat of Dracula looms. Along with all the fascinating historical information, there's also a mounting casualty count, and the big showdown amps up the drama by pulling at the heartstrings at the same time it revels in the gruesome. Exotic locales, tantalizing history, a family legacy and a love of the bloodthirsty: it's hard to imagine that readers won't be bitten, too. I loved this book. It had all the elements of a honest to goodness page-turner; romance, intrigue, compelling characters, rich historical detail, and of course, a story that, like the vampire itself, has withstood the test of time by capturing the the essence of our humanity and drawing upon our greatest fear. There is an abbreviated epistolary format to this novel, which I normally do not care for. But Kostova's narrative is clean, fluid and dexterous. She pays careful attention to detail, but does not get mired down in pointless elaboration. There is an abundance of factual information here that at times, becomes convoluted and laborious. However, it is these same facts that lend a sense of authenticity and plausibility to a subject that can, and at the hands of less skilled individuals, often does become farcical. For that reason, this is not light reading, but it's well worth the time spent to get to heart of the story, which does not dissapoint. My only criticism is that we did not get to spend more time with our villain. For all the time spent building up to his appearance, it is all too brief. Vlad Tepes, as both a literary and historical figure, is at once provocative and repugnant. 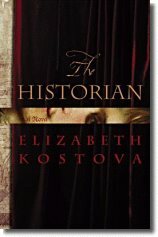 His life and his legend posess great potential for literary exploration, and Kostova does a good job of exploiting that potential. But I would liked to have seen more interaction between Vlad and the other charcters, particularly Helen, who is desceded from him. I would also liked to have seen some examination and possibly illumination of his more human side, rather than just another comfortable characterization of the monster we already know so well. If you're a lover of Vampire lore, this story is true to the roots of the legend. I think Stoker would be thoroughly entertained, as was I.